Think before you shop. A little bit of forethought can save time down the road and magnify your efforts. As the old saying goes; a stitch in time saves nine. Before you step out the door to go shopping, make a detailed list of what you are going to buy and donâ€™t deviate from that list. It’s common for people shopping from a list to add a ‘reward’ item after they’ve bought everything else they came for – isn’t getting everything you need reward enough? Use your own cloth bags or even cardboard boxes for groceries (if you ask the stockers nicely, they’ll tell you where the store puts its packaging before throwing it away). This will keep you from using new paper or plastic from the store. Switch to reusable items. For example, try Tupperware instead of disposable sandwich bags. Multi-use razors are preferable to disposable razors and cloth dish towels trump paper towels. Every time you use a refillable bottle, it’s like saving the entire package. 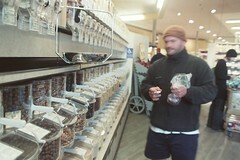 Many everyday items (including breakfast cereals, honey, spices, cleaning products, and more) are available as refills. Photo courtesy of gisarah at Flickr.com. Purchase bulk items. Try to avoid packaged foods, especially those individually wrapped cheese slices! Seek out loose produce. If the produce has a thick skin, there’s no need for a plastic produce bag either. After all, if oranges, squash, watermelons, and other produce can keep bugs off in the wild, they already have enough natural packaging. 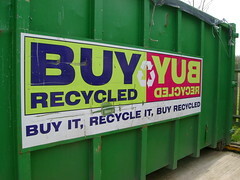 Try to purchase goods that are high in recycled content. When you buy items with recycled content, you close the loop and create a market for recycled goods. That creates an economic incentive for recycling programs and reinforces the efforts of others. Also, buying items made with recycled content neutralizes the impact of buying the good – think of it as “pre-cycling”.